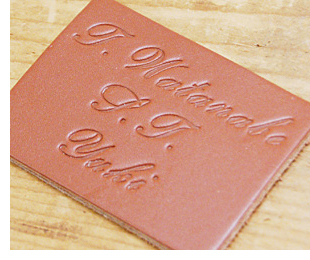 Our personalization service allows you to have your name or initials debossed on your Itagaki wallet or accessory. Debossing is a process in which the letters of your choice are permanently stamped into the leather. Adding this personal touch is especially ideal for gifts. Our personalization service is available at all Itagaki stores as well as at certain events. Customers of Itagaki are welcome to have their wallets and accessories personalized free of charge. (This service extends only to wallets and accessories. Bags are excluded). Since the font used is a handwritten style font, we typically combine a capital letter with lowercase letters when spelling names. Using exclusively uppercase letters is not recommended as the result generally appears imbalanced. The total allowable characters are 10. Incorporating more characters makes it difficult for the debossing process to occur cleanly. On most products the debossing is performed on the exterior of the product. In the case of wallets and business card holders, debossing your name on the inner flap is also possible. Allow our staff to make recommendations regarding your personalization. In the "Remarks" column of your order entry form please specify the name that you want debossed and where on the product you would like it. If you have purchased multiple items please take a moment to list each name to be personalized next to the corresponding product number and Color description. Note: Once a product has been personalized it can no longer be returned unless the product is defective or if we have made an error in the personalization.